These materials are often manufactured from quite exotic blends of various minerals and elements, and the colour of light emitted is dependent on their precise chemical composition. Left in the open air for prolonged periods they can degrade and are easily damaged, so for optimum performance they should be sealed into a chemically inert environment where they are also protected from mechanical abrasion. 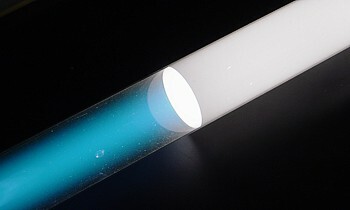 For practical purposes in the case of the fluorescent lamp, the powders are mixed up into paints which are coated onto the inner surface of a glass tube. This is further processed as the envelope of an electric discharge lamp in which ultra-violet radiation is generated. The tube is evacuated of all air and filled with a little mercury vapour plus a rare gas. An electrical discharge can then be struck between a pair of electrodes at either end. This ionises the mercury vapour, which produces a small amount of blue-green light and a tremendous quantity of short wave Ultra-Violet radiation at wavelengths of 253.7nm and 185.1nm. What makes the fluorescent tube fundamentally so efficient is the extremely high efficiency with which it is able to convert electrical energy into this UV radiation. Only a tiny proportion of visible light is radiated by the low pressure mercury discharge, this being predominately at the wavelengths of 405nm (violet), 436nm (blue), 546nm (green) and 577nm (yellow). In combination these lines give the discharge a pale blue colouration, which can be seen in the photographs below. The UV is of course invisible and quite useless for lighting applications, but when it srikes the phosphor on the inner surface of the glass tube, it is converted into visible light. Figure F5 shows a demonstration tube specially made up by Thorn Lighting, which has been left partially uncoated. Here it is possible to see the bluish glow of the mercury discharge as well as the luminescent properties of the fluorescent coating - in this case a white emitting powder of calcium halophosphate doped with mangenese and antimony. 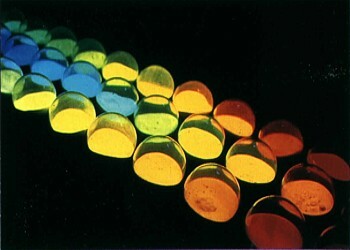 There are dozens of different phosphors in use today - some of which radiate very broadly across many different wavelengths, others showing narrow band emission of just one colour. By applying them in isolation or blended together, it is possible to achieve almost any desired colour or shade of white. Figure F6 demonstrates the principle in another special tube from the Jules Thorn Laboratories at Enfield, London, which has been made up with a coating of red phosphor on the right, followed by a band of green, a band of blue, then with all three mixed together to produce white light, and finally on the left an uncoated region showing the mercury discharge inside. Incidentally, note how the discharge terminates primarily on the upper surface of the cathode - the lamp in the photograph is being operated on a switch-start circuit and the current is supplied via the upper lead wire to the electrode. 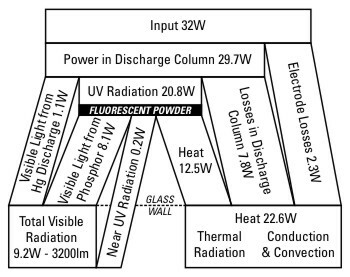 Over time as the electron-emissive coating is consumed, the discharge root will progressively move across to the other side of the cathode coil. The principal reason for the high performance of fluorescent lamps is the very high efficiency with which each of the aforementioned steps takes place. 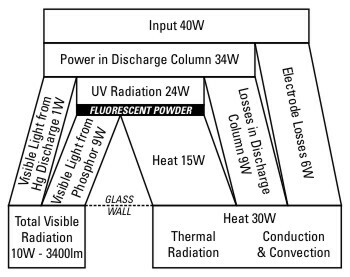 Even though only about 3% of the power consumed is converted into visible light by the mercury discharge, some 63% of the input energy is converted into the shortwave UV-C radiation which drives the fluorescence process. Over the years the thermal losses in the discharge column have been minimised by optimisation of the gas filling and lamp geometry, and heat losses at the electrodes have been reduced thanks to the highly efficient cathode designs found in modern lamps. To illustrate the range of efficacies found in typical lamps on the market today, Figures F7 and F8 below show the energy balance of the classic 4-foot 40W T12 argon-filled tube with halophosphate coating and operating on a conventional magnetic ballast, alongside that of the modern 4-foot 36W T8 krypton filled tube with triphosphor coating, and operated on a high frequency electronic ballast. The primary reason for the increased efficacy of the T8 tubes is the use of a krypton filling, which dramatically reduces power losses at the electrodes.